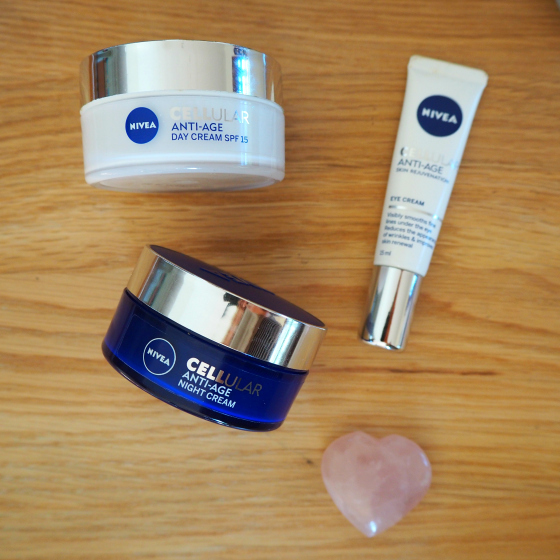 I’ve mentioned the NIVEA CELLular Anti-Age skincare range here briefly before (maybe you’ve started using it?). At the time I did mention that using it felt like I was cheating on my skin’s former NIVEA favourite, the Q10 Plus Anti-Wrinkle skincare range. In this post, I want to go into a bit more detail as to why CELLular might be your new best skincare friend and why the range is a better option for my skin than Q10. It’s partially a physical age thing; partially the needs of your individual skin. I’m reaching the upper end of my 40s. I’m closer to 50 than 40. There, I’ve said it. I’ve never made my age a state secret, nor have I made my desire to keep my skin looking the best it can be a state secret. The trick over the years has been to keep up with what my skin needs because those needs change with age and environmental factors. The Q10 range includes the Q10 co-enzyme, which is designed to charge up your skin’s cells, give them a boost, protect and hydrate. It works and I found effective. It’s going to be noticeably more effective if you’re in your 20s and 30s and seeing the first of any fine lines. If you’re in your 40s and 50s then you might want to look at upping the ante with NIVEA CELLular. Not only does the science behind the range charge up the metabolism of the skin’s cells, it “teaches” skin to behave younger, so skin cells are rejuvenated, hydrated and revitalised. I switched from Q10 to trialling CELLular in January this year and keep coming back to it in between trialling other skincare sent to me as part of my job as a beauty writer. A test for me as to whether something is working is whether I re-stock the product after I’ve finished the sample initially sent for trialling. I’ve done that with each of the products in this range and I can’t imagine changing that buying habit any time soon. I know it’s easy to get bamboozled by the science behind skincare. It can feel like a bit of marketing hype, to be honest, which is why I always like to break it down for you. In this case, there are three main ingredients that are responsible for this range making a youthful difference to ageing skin. They are ingredients that all occur naturally in the skin, so the products work in harmony with your skin. Hyaluronic acid: this is found in abundance in young skin as well as in the fluid that cushions and lubricates joints in the body. Hyaluronic acid can hold up to 1000 times its weight in moisture. It naturally depletes with age so we lose that plumpness to our skin. Having it in this skincare range helps to change that by plumping and firming the skin and smoothing out wrinkles. Creatine: this is a nitrogenous organic acid that is naturally produced in the liver to help supply energy to all cells in the body. Having it in skincare helps to boost energy in the skin that is naturally lost over time. Magnolia extract: this is a powerful antioxidant – antioxidants fight damage from free radicals that cause the visible signs of ageing. They also protect your skin and when combined with a SPF it offers super strong protection. At night, antioxidants help repair skin cells. Each product – the Day Cream SPF 15, the Night Cream and the Eye Cream – all retail for under $30 each, which makes each an easy sneaky supermarket purchase. NIVEA CELLular Anti-Age Facial Day Cream SPF 15 $27.99: the mildly fragranced formula will help reduce wrinkles and improve the firmness and appearance of your skin while its SPF and UVA protection help stop further damage from the sun. NIVEA CELLular Anti-Age Facial Night Cream $27.99: night time is when our skin has its greatest chance of rejuvenation and regeneration. This mildly fragranced formula supports that, melting easily into the skin. Skin feels smoother and plumper the next morning. NIVEA CELLular Anti-Age Eye Cream $27.99: this formula is fragrance-free and lightweight – purposefully for the delicate and sensitive skin around the eyes. Use during the day and you’ll see skin is immediately refreshed. Over time, fine lines are smoothed. As I said above, I have used these products extensively since receiving in January. During that time, I’ve used some other products as well but this is one of those others that I definitely keep coming back to. I decanted part of the Night Cream into a small travel tub for taking on my recent trip to Thailand. This moisturiser was particularly effective for when I was on the plane. The moment I was seated, I removed all makeup and added this to my face. My skin did not have that dry, tight feeling at the end of the seven-hour flight, that mostly comes with the territory of long flights. The eye cream does not irritate my eyes thanks to its fragrance-free status and seems to immediately visibly hydrate and refresh that area. All products working together have certainly added to the overall result I’m seeing on my skin. There are never massive changes as I’m always using SOMETHING morning and night but I do get comments when I have facials as to how good my skin is for its age. I take great delight in answering their “what are you using on your skin?” with a range of accessible skincare products. Fancy or expensive products do not necessarily mean at better result. The research that goes into products like NIVEA CELLular is the result of 100 years of expertise in the field. Never discount that research just because you’re buying budget skincare. The other important thing in all of this – no matter what you’re putting on your face – is consistency. I’ve had a super consistent skincare regime for my entire adult life. The consistency thing is key to helping your skin along as we age and the key to finding that consistency is knowing what your skin needs, adopting and using products that are no fuss to buy and use. If you have been consistent with what you’re using on your skin right now and you’re happy with how your skin is tracking, then you may not be seeking a product alternative. If you would like to ramp things up a bit but still within an accessible, budget-friendly skincare range, then I think CELLular Anti-Age is worth a try. So tell me, is your skincare routine working for you? 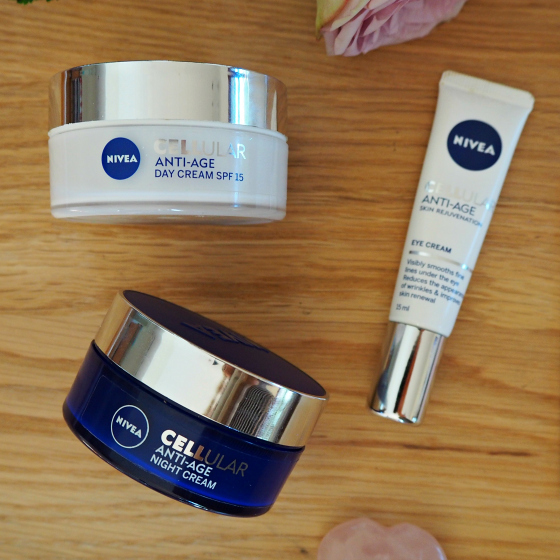 Have you tried the NIVEA CELLular range? I read your article and I’m a bit confused! I’m 27 and I want to star using anti-ageing products for my face but I can’t choose between Q10 and the Cellular… Which one do you recommend? I’d go Q10 for you Demi – Cellular is for older/drier skin. Let me know how it goes for you Monique! Glad you like the red lippie! Firm fave of mine now. my concern with this is that the day cream only offers SPF15 whereas a lot of the others now offer higher SPF’s, and I don’t feel as “safe” wearing this as I would with other brands, or an actual sunscreen. However, the night cream sounds really good so I am keen to give that a go! I am a long term nivea lover so this is music to my ears being (slightly) over the 40 mark myself! Here’s my take Rachel – if I’m doing a typical day working indoors then I feel the SPF15 is sufficient. I always wear a SPF30 or 50 if spending time outdoors, so would add this on before my makeup. I must try this! Hard to go wrong at that price! You really can’t go wrong Jess – particularly if this is where your skin age is at right now. 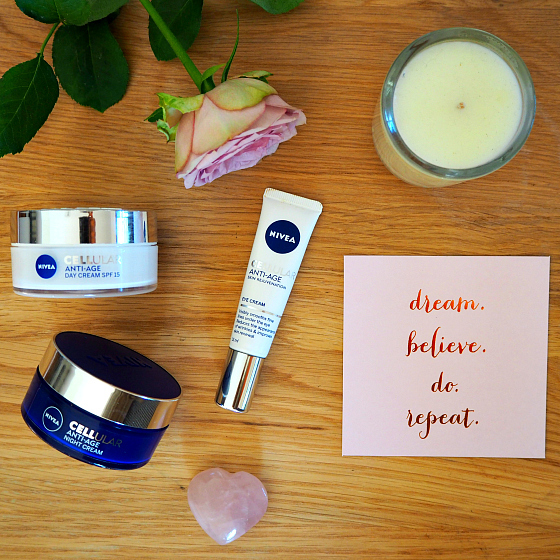 I love Nivea creams, too, but I switched to Aldi skincare, & loving it. I use the Lacura “Daily Face” moisturiser (pink for sensitive skin) @$4.99. Night cream “Caviar” is $7.99 (?). Also, the Lacura eye cream tubes are the bomb. The face cleansing wipes are $1.99. Ponds Cold Cream cleanser. Absoloutely fantastic stuff at great prices. Well I’d like to try a sample of this Nikki,I just went to Myer yesterday and bought some of my favourite night cream Lancôme’s Nuero Calm but I did get a lovely GWP! The current GWP is lovely isn’t it! Consistency is so key, Lisa!